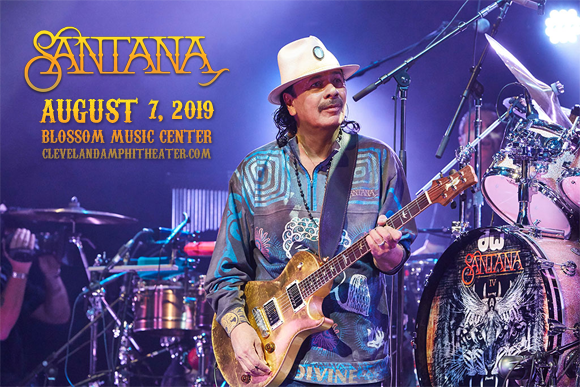 Santana are coming to Blossom Music Center on Wednesday 7th August 2019 for the second night in a row of their Supernatural Now Tour! The tour is a celebration of three things for the seminal band: the 50th anniversary of the Woodstock appearance that kickstarted their career; the 20th anniversary of their 9x Grammy Award-winning, 3x Latin Grammy Award-winning, multi-platinum-selling album Supernatural; and the release of their 25th studio album this summer! Joining the festivities will be The Doobie Brothers, in support! It's going to be an unforgettable show! Formed by Mexican-American guitarist Carlos Santana in San Francisco, California in 1966, American rock band Santana came to public attention in 1969 at the now-famous Woodstock festival, where they were regarded by many to be one of the highlights of the event. Their self-titled debut album came later that year, and was an international hit, peaking at Number 4 on the Billboard 200 and Number 26 on the UK Albums Chart. Santana's popularity steadily increased over the years, with the release of several albums and a dedicated touring schedule, but a lull in sales caused the band to take a seven-year hiatus from recording in 1992. The band made a victorious with the fifteen-time platinum-selling, Number One album Supernatural, which launched the Number One singles "Smooth" (ft. Rob Thomas) and "Maria Maria". The band and album were honored with nine Grammy Awards, including the award for Album of the Year (a tie with Michael Jackson for most Grammy Awards won in one night), and also won three Latin Grammy Awards, including Record of the Year. In 1998, the band was inducted into the Rock and Roll Hall of Fame.